Over the past few years, Australian companies have operated in a low and falling bond yield environment. There are beginning to be signs that this multi-decade trend is reversing. A lot of market commentary has focused on the impact that a reversal of bond yields will have on the prices of bonds and the valuations of bond proxy stocks [like real estate investment trust’s (REIT) and infrastructure] and high price-earnings ratio (P/E) stocks. We wanted to focus on the impact that higher bond yields may have on companies’ earnings and capital allocation decisions. In some cases, companies are borrowing to fund dividends. At the same time, this environment has in most cases penalised companies that have maintained a conservative balance sheet and used the falling cost of debt to de-lever. A key plank of Perpetual’s investment process is looking to invest in companies with a conservative balance sheet. The benefits of a business maintaining a conservative balance sheet have not been evident over the last few years, however we feel as we move into a rising interest rate environment those businesses will start to get rewarded by the market. Looking at the S&P/ASX 200 excluding Financials, Resources and Property stocks, we have compared the leverage and funding costs in FY14 verse FY17. During this period, the aggregated leverage of these stocks has increased from 1.6x ND/EBITDA to 1.8x ND/EBITDA. This increase in leverage has occurred at the same time the average cost of debt for these companies has fallen from 6.5% to 4.8%. Hence despite higher absolute levels of debt, we are seeing lower absolute levels of interest expense. Companies have used the cheap cost of debt to lever up. One example of a company that demonstrates this funding cost tailwind clearly is Amcor (ASX:AMC). As shown in the table below, since FY14 AMC has added just over $US 1 billion of net debt yet net finance costs have gone backwards by $6 million. This implies AMC’s average cost of debt has fallen from 6.4% to 4.6% and leverage has increased from 2.1x to 2.8x over this period. Most Australian companies’ interest costs are a derivative of the Australian Bank Bill Swap Rate (BBSW) and a spread over this rate which is a factor of company specific risk. The BBSW is generally a function of the RBA cash rate. However, as seen in the chart below the BBSW has blown out over the past two months. We have observed similar moves in other key global reference rates including the 3-month US London interbond offered ratio (LIBOR). 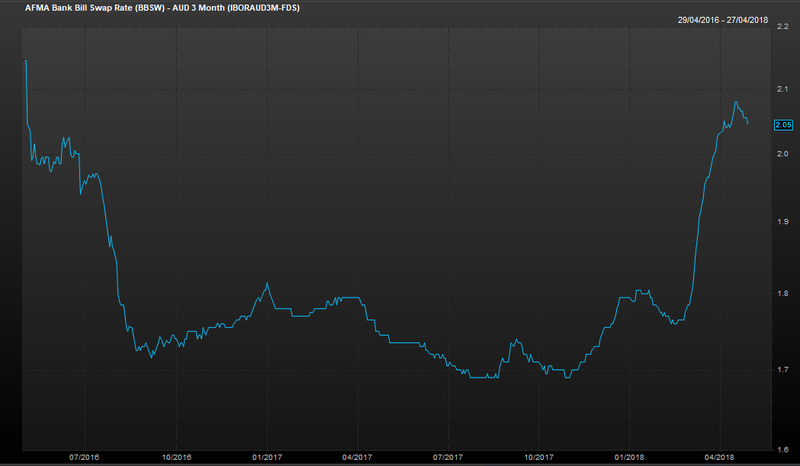 Given the significant moves higher in the BBSW, variable interest costs will be moving higher over the coming months for Australian companies. Similarly, increases in longer dated bond yields and commentary from central banks point to an increasing rate environment moving forward. Therefore, we think it is timely to analyse the implications this may have on companies in which we invest. Every company has a different debt structure with varying mixes of floating/fixed and maturation profiles, thus each company will be affected by rising rates to a different extent. To illustrate the sensitivity, (using AMC as an example), if we were to assume that AMC’s debt level stays flat at the FY17 level of US$4.05 billion and the average cost of debt increases from 4.6% to 5.6%, AMC’s finance cost will increase by $40 million. This would represent a 4% profit before tax headwind. For companies that are heavily geared and pay out a significant portion of their FCF as dividends, this headwind is likely to become material. Whilst the increased funding costs will have a direct impact on earnings and FCF, there is a secondary effect on management behaviour regarding capital allocation. We would expect that higher funding costs, longer term will result in lower payout ratios, less share buy-backs and debt funded acquisitions. The latter two of these have been key drivers to EPS growth for a lot of ASX listed companies over the last five years. We surveyed several sell side analysts on what their assumptions were for the cost of debt in FY21 for the companies they cover. The average across all companies was 4.8%. This is slightly up from 4.6% for those same companies in FY17 yet well below the 5.6% cost of debt in FY14. We strongly believe that analysts are materially underestimating the cost of debt over the medium to longer term when coming up with their forecasts and valuations. From an earnings perspective, we believe that higher funding costs will result in downgrades to EPS, especially for more highly geared companies. We also believe that manufactured EPS growth through debt funded acquisitions and buy-backs will become less and less attractive providing further headwinds for highly geared companies.